click photo to enlarge Puerto Vallarta was, by far, our favorite stop. 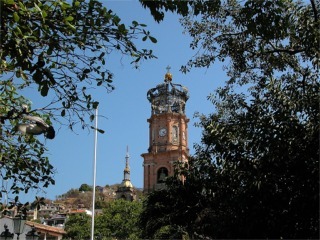 The town is very beautiful and still retains it's old world Mexico charm. 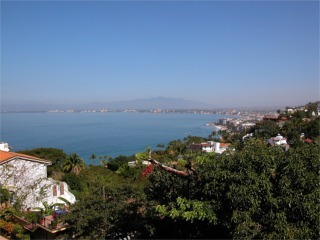 This picture shows the city off in the distance along Banderas Bay. In the jungle, outside of town, is where our California Governor Swarzeneggar, filmed his movie Predator. click photo to enlarge Along the beach front, called the Malecon, they have sculptures and benches to sit and enjoy the view. 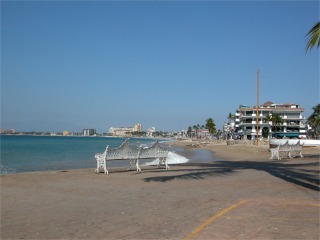 The town and beachfront are very clean. click photo to enlarge The famous church, Cathedral of Our Lady of Guadalupe. 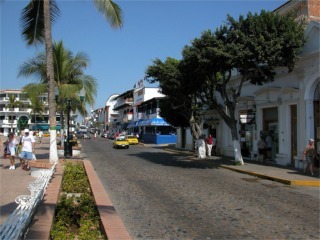 Puerto Vallarta is also well-known for an area called "Gringo Gulch." Richard Burton had a house there, and bought one across the street for Elizabeth Taylor. He had a bridge built across the street between the two houses. They were having an affair while he was filming Night of the Iguana in Puerto Vallarta. click photo to enlarge This is the roadway along the Malecon. Note the cobblestone streets. I understand they get quite slippery when it rains. 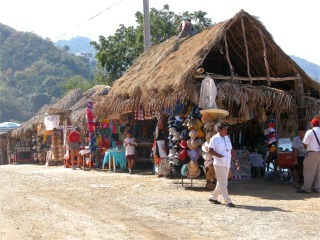 click photo to enlarge A roadside shop outside of town. It is very easy to get around Puerto Vallarta. We just rented a taxi by the hour. The only downside to visiting by cruise ship is you only have a few hours to enjoy a city. In some cities that is enough, but others.. well, we spent a week in Puerto Vallarta in 1998.